A few years ago a friend sent me some moringa trees to plant and that was my first introduction to this amazing plant. 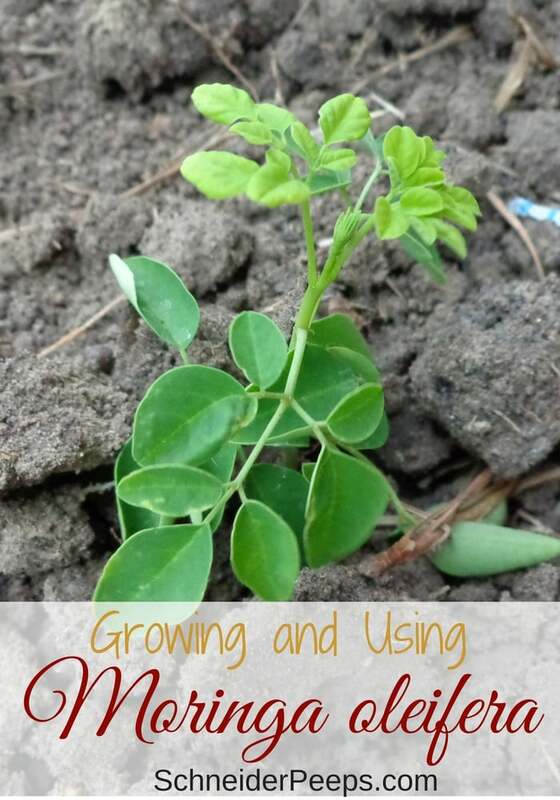 Growing a moringa tree is easy and it can be grown as a perennial in climates where the ground doesn’t freeze and as an annual in climates where the ground freezes. They are fast growing trees and the leaves and seed pods are edible. Moringa leaves have 2 times the protein as yogurt, 7 times the vitamin C as oranges, 3 times the potassium as bananas, 4 times the Vitamin A as carrots and 4 times the calcium as milk. Moringa leaves also contain vitamins B1, B2, and B3, as well as chromium, copper, fiber, iron, manganese, magnesium, phosphorous, and zinc. You can also eat the flowers and the seed pods. In fact, in many cultures, the Moringa oleifera tree is called The Tree of Life. t can be used topically for wound care. And it’s being used in cancer research. Moringa also has complete amino acids which makes it an excellent choice for vegans to round out their diet. It can be used in livestock fodder and animals love it. So you might want to protect it from rabbits, chickens, goats, sheep, etc. while it’s growing. And probably the coolest thing is that the crushed seeds can be used for water purification. Of course, you’d need a lot of seeds but it’s still a pretty great benefit of moringa. 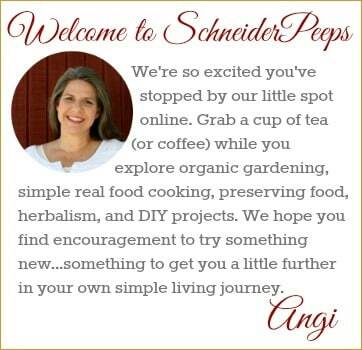 Of course, you can buy moringa capsules and powders for anywhere from $14-$25 a pound. But why, when you can just grow your own moringa tree. Slight rant ahead – There are have been some companies that have made a LOT of money convincing people that their Moringa oleifera is the only true Moringa oleifera and that in order to benefit from moringa you need to purchase from them. My husband ran into one of these unsavory characters at a local health fair and he brought me the literature. The man assured my husband that there was no way we were growing it in the back yard because the multi-level company he represented had the only true Moringa oleifera trees. Here’s the deal, if you choose to purchase moringa as a supplement instead of growing your own, that’s totally fine, I just hate that people are being misled by companies. One of my goals is to grow things instead of buying them at the store – not only fruit and vegetables but herbs, supplements, and even luffa that I use in place of synthetic scrubbers. I use some printable worksheets to help me keep track of what I need to grow for our family for a year. You can get these worksheets emailed to you by filling out the form below. Moringa can be started by seeds, a cutting or by root stock. I’ve only started it by seeds. 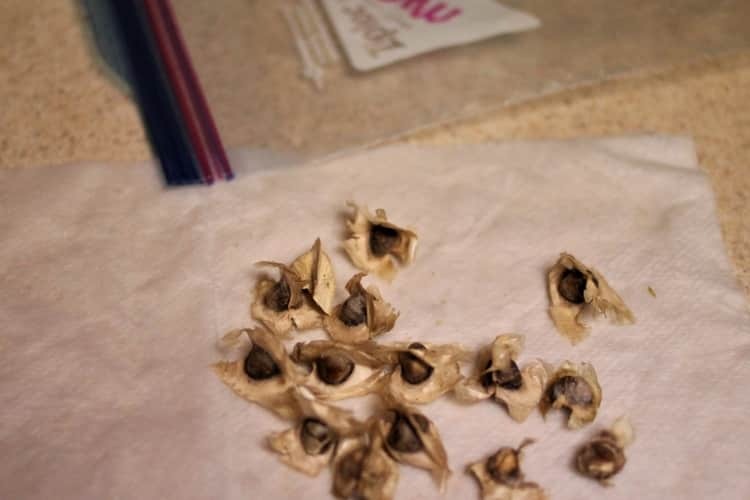 The seeds are pretty tough so I like to put them in a damp cloth or paper towel and then put them in ziplock bag that’s not zipped all the way and let them sprout before I plant them. After they’ve sprouted I plant them in small pots until they are about 4-6 inches tall. Moringa will grow in almost any soil but it really likes well drained soil. Water regularly the first few months then just water when it seems like it needs it. If you live in a area that gets little rainfall, you’ll be glad to know that Moringa trees are very drought resistant. It has a deep tap root that will draw up water to keep the tree alive – but it might not flower. Moringa trees will flower and produce edible seed pods (similar to green beans) when there’s adequate water, so if it rains a lot where you live, it will flower a lot. If it doesn’t rain much, you can force it to flower by watering. 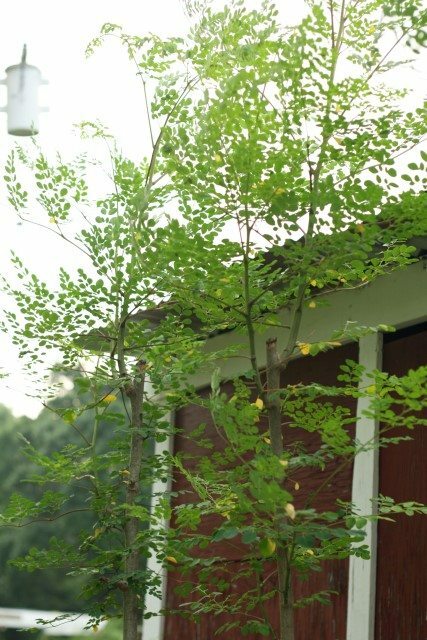 Moringa trees are fast growing tress and can grow 15-20 feet in one season, so plant it where you want it, like I said earlier, it sends a deep taproot down so it will be hard to move. Don’t be shy about harvesting the leaves, it will just produce more. In order for the moringa to have a small canopy instead of growing straight up, regularly cut the top back and it will fan out. Moringa trees like warmth so in the US it will grow best in zones 9 and up. If you live in a colder climate, you can still grow it as an annual or in a container and bring it in for the winter. If you live in a zone 9 and up and it happens to freeze, your moringa trees will die back. However, as long as the ground doesn’t freeze, they’ll pop back up from the roots in spring. 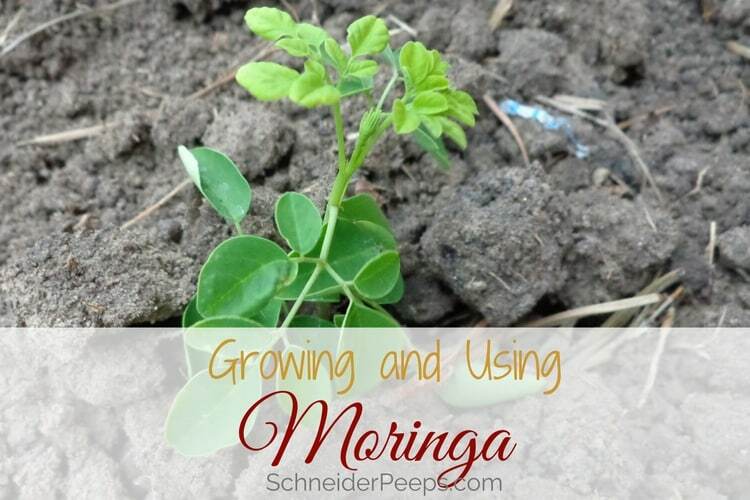 Growing moringa in the US is usually pest free, however, if the roots are continually wet they can develop root rot, so make sure you plant in well drained soil. You can harvest moringa leaves and eat like spinach. The pods can be harvested when they are young and snap like green snap beans. They need to be harvested very young as the seeds grow super fast. I like to dehydrate the leaves to use as in teas and in our cooking. I’ll do some throughout the summer and then before we have a freeze I’ll harvest them all and dehydrate them. The mature seeds can be dried out stored to plant later or to crush to use for water purification. While moringa has some pretty impressive medicinal benefits, our family uses it as food not medicine. I like to use it as a nourishing tea in the afternoon, it really doesn’t have much flavor at all so I add hibiscus or spearmint to the tea. I’ll use is fresh or dehydrated in soups, rices, or in eggs. Pretty much, I just sprinkle it on things I’m cooking to give extra nutrition. We also add it to smoothies, this increases the nutrition and reduces the cost of smoothies – which can get pricey. But moringa can also be used in skincare such as moringa soap, infused in oil to use in salve making, or infused in apple cider vinegar to use as a face toner. After you dehydrate moringa you can use a coffee grinder (that’s set aside for herbal use) and a capsule making machine to make your own moringa capsules. You can use the same process I share in this post on using nettle for allergies. The moringa powder can also be added to treats like these dark chocolate coconut treats from Oh, Sweet Mercy. Do you grow or use Moringa oleifera trees? If so, what tips do you have for us? Thanks for sharing all this lovely information on this Moringa…very interesting. Thanks for the opportunity to try and win this. I have never heard of Moringa! Thanks for the chance! Such a interesting giveaway-very awesome!! This tree is new to me!Sounds great, thank you for the opportunity!! Thank You for a unique giveaway!! The Moringa is new to me, would be quite the experience to grow it!! Gosh, I sure wish we had a warmer zone….but afraid not!!! I too have never heard of this plant but will keep it tucked away in case we ever do get moved to a warmer zone!!! Thank you for the information and hosting the giveaway! I’ve never heard of moringa, but I’d love to give it a try to amp up the nutritional profile of our meals! Thank you for the giveaway! It’s wonderful that it can do so much. Can’t wait to research all its healing properties. Been thinking I would like to try growing one. Thanks for the opportunity. Other than learning about other farmers, growing unique plants and making things from scratch in my state, I am exited by the wealth of nutrition one can get by eating any or all part or this tree. Since Blue Yonder Urban Farms are in the same planting zone that I’m in it’s means I could actually grow Moringa Trees here on my small farm, which in very hard to do in our hot desert climate! Thank you so much for posting about this fascinating tree and farmers! I take a supplement with Moringa in it. I would love to grow it myself!! Glad to hear that others are too!! I take a supplement with Moringa in it! I would love to grow this myself and so glad to hear that others are too!! Thanks for the information! Would love to try and grow this. We are not always warm but I would bring it inside when it got cold. Not many plants can claim to be a complete protein. Loved the article. My daughter is anemic so I’m going to get some for her. I’m want to plant some as well. Thanks. Intrigued with this universal plant. Eating the leaves gives you so many vitamins that we need. Really need this plant since it helps with anemia (mine is due to meds), Also to be able to use the seeds to purify water. Thanks for bringing Moringa to my attention. natural fence if properly trimmed. Nutritious and functional. Blue Yonder Urban Farms also sells the seeds. That may be the way to go to make a fence. That’s a really great idea by the way. Great information! I’m vegan, so I’m always looking for new sources of protein to replace meat/dairy. I was surprised to read that this plant offers 2 times the protein as yogurt. Can’t wait to grow some! It’s really amazing. And the protein is complete protein which is very uncommon in the plant world. Karen from Blue Yonder Urban Farms is also a vegan and she’s seen some interesting results after adding this to her diet. I have been hearing all sorts of wonderful things about this plant. I think it would be interesting to grow and see how it does and be able to share with my friends. I have wanted to find some molenga trees. I live in Florida, so they would be perfect. I tried Moringa for the first time in Haiti last October. It grows wild there and the mission compound where we stay has several trees. We picked the leaves and scrambled them in our eggs for breakfast. Very tasty! I can wait to get my little piece of the country and start growing it myself. That is really cool. It’s really an amazing plant. I think they can be grown in posts, too. They won’t get as big but that might be an idea. Loved this post! Could we get a post with updated pictures, your experience with it so far, ans a simple taste profile? I looked, but only found a soup recipe! Sure, I’ll update it this week. Hi, I’m interested to see how the trees are doing. I’m from the Philippines and moringa which we call malunggay is part of the regular diet of many. From where i lived, We usually cooked the leaves in coconut milk and with or without meat. I live in zone 8 now. I’ve been wanting to grow it but I don’t know how knowing it loves the tropics. I got excited when I saw your baby trees! I have a few mature seeds with me for a few years now and I’m not sure if they are still viable. So thanks for the purchase link, I may just need to order them. But then it looks like my only option is container growing. Hi Beth, We planted the trees on the south side of our garden shed and three have survived the winter. We’ve had a really wet spring and some of the leaves are yellowing – I’m assuming from too much water. I anticipate that they will survive just fine for us (in zone 9). You could grow in a pot and bring it in when it gets too cold or even just grow it as an annual for the leaves. That is what Karen from Blue Urban Farms does. WOW! I was just reading about the health benefits of this tree just the other day and wishing I could get one to grow. Timely post I say and someone is going to be very happy when they win. 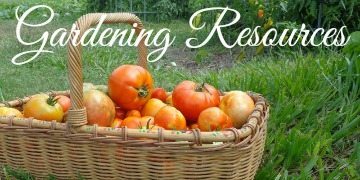 We are presently adding more fruit bushes; blueberry , grape vines; black concord and muscadine and an apple tree to our garden area. Isn’t it amazing? When I first heard about it I thought it was a total crock, then I started digging deeper and deeper into researching it. I’ve been dehydrating the leaves and sprinkling them in rice, eggs, soup, potatoes kind of like a seasoning but you really can’t taste them. Nothing like adding some extra nutrition to family favorites. I received seeds from Blue Yonder and planted them 2 weeks ago they are already 3 inches tall never seen anything like it the temp. here in Phoenix is 108 has no effect on the tiny trees I water them every day right now.I am so excited. I’m so happy to hear that, Dorothy! My trees are over 10′ tall and we’ve been harvesting leaves for weeks since nothing else is really growing in our 100 degree weather. we made stuffed shells the other night and added moringa to the stuffing, they were wonderful! Can Karen use your comment as a testimonial on her site, with just your first name and last initial? No pressure, I just know I would want to, so I thought I’d ask for her. Thanks!!! I am very interested in purchasing but have 2 questions. I live in Bullhead City, AZ area. Hot summer and chilly winter which can get below freezing and of course very windy. Windy. When is best time to plant and in order to grow do you need to plant more than 1 seedling? Hi Emma, I’m not sure about the wind but the moringa will love your hot summers. 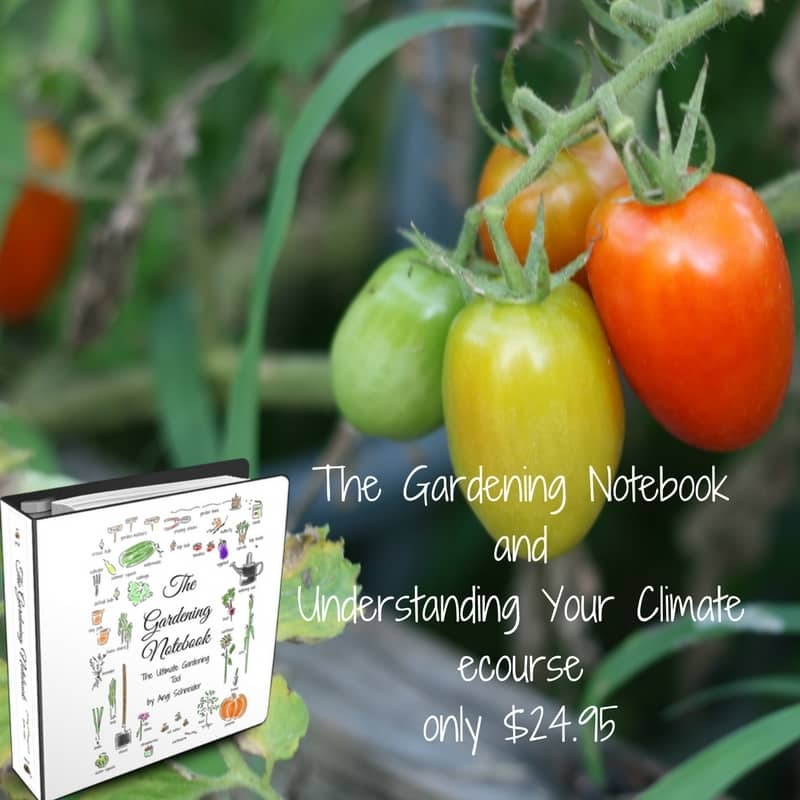 You are in a similar garden hardiness zone as I am and my moringa is doing great. I planted it on the south side of our small “barn” to help break the northern wind. As long as your ground doesn’t freeze the moringa should come back year after year. We planted four seedlings and three have survived. I’m not really sure what happened to the other one but it was the closest to the edge of the barn and didn’t get as much protection. You can also grow morninga in a pot and take it inside if you think the winds would be too much. You can also grow moringa as an annual and plant a bed of seeds and harvest the leaves. Blue Yonder Urban Farms does that and they live in Coolidge, Arizona. You can also propagate it faster and easier by using its branches instead of from seed. Just cut off a woody branch about 1 1/2 ft length by 1 inch diameter. I like to peel off some of the bark from the planting end, and put some manure into the planting hole. Just don’t let it dry out. You should have some leaves in about 3-6months, and pods in about 8-12months. I dry the leaves to make tea, boil the pods to eat like edamame appetizers. I believe in this tree so much, I have planted more than 10 around the front and backyards and have started planting more in plastic grow bags to sell to anyone interested come Spring when they are rooted..
oh, that is great to know! I’m going to try that this spring, thanks so much for sharing your tips! I believe in it too. We eat the leaves in soups and I dehydrate them for tea. We haven’t had any pods yet. We had a flowering part but my son cut it down when he went to harvest some leaves for me. The local health food store sells moringa for $26 for a small bottle of capsules. It makes me sad that people are buying it when they can easily grow it here. Hi Corinn, I’m so glad your trees survived! Moringa doesn’t get a big canopy put the more you harvest and cut the lead trunk down the more they will spread out. Ours have grown to over 12 feet tall. I *try* to keep it trimmed to about 6-8 feet but it grows really fast during our hot summers. For harvesting leaves, I like to wait until it’s about 4 feet tall, just so I know it’s growing well. I’ve always worried about taking too many leaves but last summer, our moringa trees went through hurricane Harvey and were stripped bare, all that was left was a stick from the ground, no branches, no leaves. In just a few weeks it as covered in new growth, so now I won’t be shy of harvesting leaves. One more thing, you can propagate moringa from the roots, so when you move, you might want to break off a couple of roots and see if you can start new trees. Hope this helps. Moringa grows everywhere here in Africa – just last week for a school project my daughters class went to a village school and planted 100 moringa trees 🙌🏻 The benefits are amazing and seemingly endless !! I can purchase capsules and powders and teas here for very cheap!! We take the capsules and sprinkle the powder into all of our homestead animals food! I hope to plant our own trees as well !! Thanks for spreading the word about this tree of life !! That’s is so great! If I could only grow one thing, it would be moringa. It’s not a fun or pretty as tomatoes or berries but it truly is an all purpose plant. By the way, I got lost in your site. Now I’m wondering if I can grow cashews here?